Dr. R L Kashyap is Professor Emeritus of Electrical and computer Engineering at Purdue University, Lafayette, Indiana in USA. He has his Master’s Degree form Indian Institute of Science, Bangalore and obtained Ph. D from Harvard University. He is the recipient of many International awards. In 2003 has received ‘Vedanga Vidvan’ award instituted by Maharshi Sandipani Vedavidya Pratishthan (Ujjain), an automous body of HRD, Govt. of India. He has awarded and distinguished Alumnus award by IISc (Indian Institute of Science) in 2010. He is the recipient of Karnataka Rajyotsava Award – 2012. He is honoured with ‘Veda Brahma’ award by Bharatiya Vidya Bhavan in 2003. Dr. R L Kashyap has received ‘Sir M. Vishveshwaraya Award’ by ‘Swadeshi Science Movement’ in 2013. He has written extensively on Veda. He has translated all the mantra-s from all the five Veda-s. They are published in 26 Volumes. 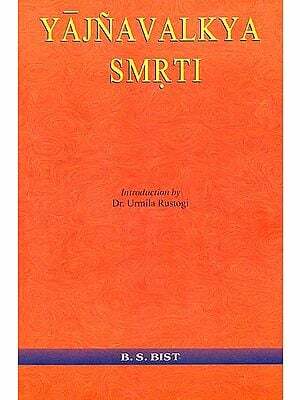 ‘Rig Veda Samhita’ – 12 Volumes, ‘Yajur Veda’ – 4 Volumes, ‘Sama Veda’ – 2 Volumes, ‘Atharva Veda’ – 6 Volumes, ‘Shukla Yajur Veda’ – 2 Volumes. Some of his widely read books on Veda are: ‘Why Read Rig Veda?’, ‘Rudra Mantra-s ‘Essentials of Rig Veda’. 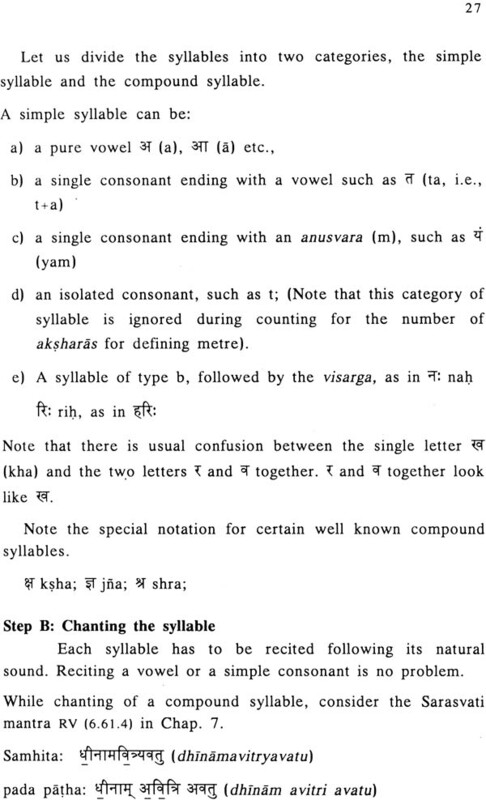 Essentials of Yajur Veda’, Essentials of Sama Veda’, ‘Work, Enjoyment & Progress’. He is the Honorary Director of Sri Aurobindo Kapali Sastry Institute of Vedic Culture, Bangaluru. 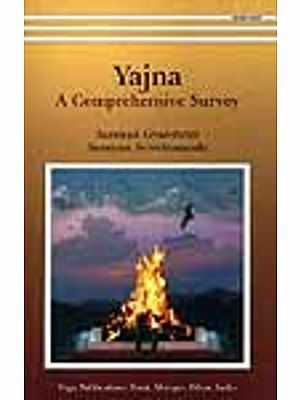 This book considers some of the basic ideas, concepts and practices contained in the most ancient books of the Hindus known as Veda-s. We will particularly focus on the concept of yajna in the Veda-s. The core of the Veda-s is a collection of four books known as Samhita-s. Hindus revere the Veda- s, not merely because of their ancientness, but also of their focus both on the unity and diversity in our universe. 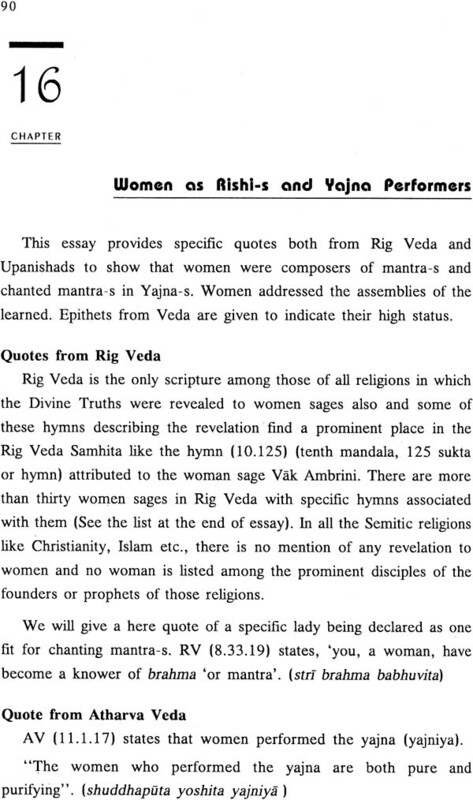 The Veda-s are the insights and experiences of about four hundred sages, among whom at least thirty were women. 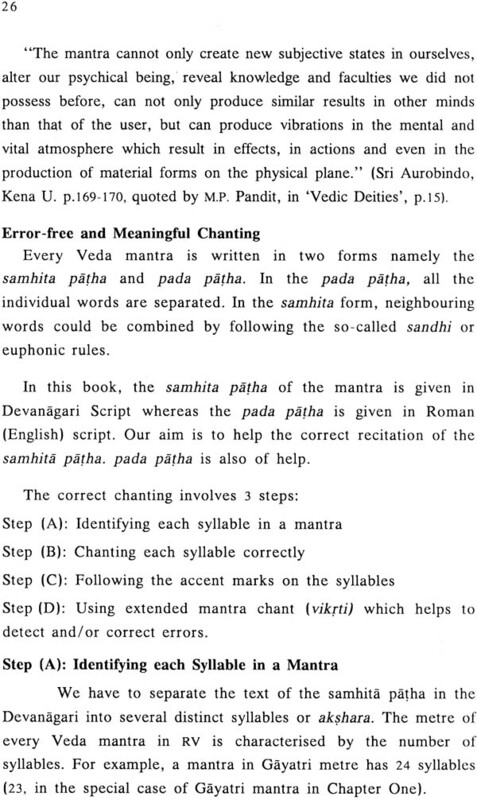 The Veda-s are in the form of metrical verses, about 25,000 (twentyfive thousand) in a language known as Vedic Sanskrit. The importance of the Veda-s lies in the fact that the Vedic knowledge has the power to harmonize and uplift. our individual existence as well as to harmonize our relationship with our neighbours, community and the nature at large. This knowledge can enable each individual to realise his/her full potential while leading a happy and healthy life, while helping others to achieve this goal. There is no need to go to any monastery. 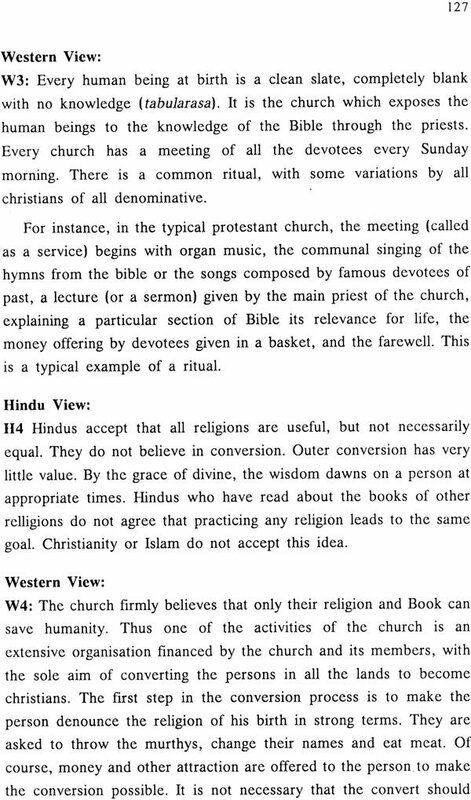 However one can opine that the Vedic knowledge may have been appropriate to that society which existed several millennia ago. How can we say that it is useful today? The knowledge in the Veda-s was not formed at a particular instant of time. It came into existence over a long period. The very first hymn of Rig Veda with its nine verses refers not only to the ancient sages (purvebhih), but also to the new sages yet to come (niitanaiiJ). This idea is in several places in the Veda. 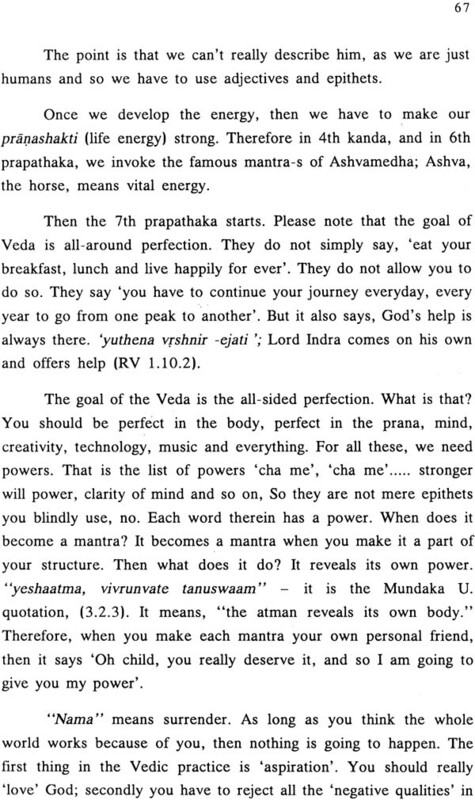 Thus Veda is not a closedup system. It is open. Newer insights can be added which are relevant to the age we live in to supplement the knowledge in the Veda-s.
Veda -s specifically support this view in a verse (1.89.1), the first verse in the hymn (sukta) 89' of book one (Mandala One) of the Rig Veda. This verse exhorts all persons to welcome all knowledge, to be added systematically at all times, provided that the new knowledge does not cause any long term divisions in the society and that the new knowledge is beneficial both physically and psychologically to all in the longrun making the society strong to face the enemies who completely oppose these ideals. For instance the Veda would welcome the all-around beneficial knowledge given by the physical sciences and technology, health sciences etc. Veda-s do not accept that there are fixed compartments in any specific field. Human beings create the barriers between the various fields because they do not have the knowledge of the links harmonizing the various fields. In course of time, these connecting links will be discovered. For instance, consider the health science. Now we have various subfields such as allopathy, homeopathy, ayurveda, unani, pranic healing, the chinese methods, the Japanese methods etc. All of these specific systems were started by wise persons. Now each school in the above group is highly critical of others. But in course of time, new visionaries will discover the connecting links between the compartments and thus render the whole system harmonious (samarasa), each subsystem helpful to a specific person at a specific time. 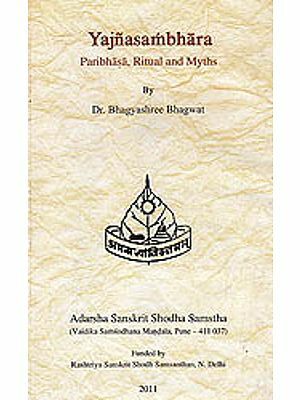 At the centre of this vedic knowledge is the concept and practice of yajna, the subject of this book. There is no single English word which can grasp its suggestions compactly. The use of the word 'sacrifice' used to render 'yajna' leads to many misunderstandings. For instance the word sacrifice in English always implies an element of sorrow if we see sentences such as, 'I sacrified my life for my parents'; 'I sacrified myself for my country'. The service rendered to the parents or country does not indicate happiness. It indicates an element of missed happiness namely if I had not served my parents, I would have been happy. The Sanskrit word yajna indicates acts of joy. Sharing what we have with others in a joyful way is stressed. 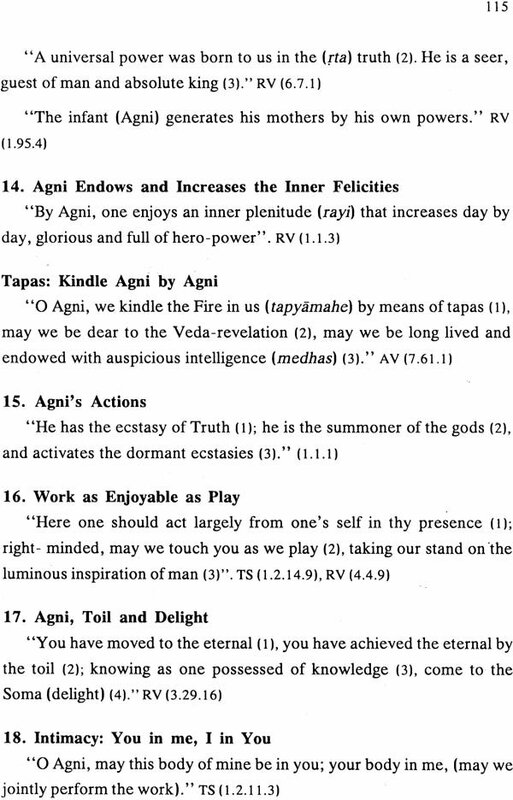 A compact definition of yajna: It is a sequence of sacred actions to invoke the presence of supraphysical cosmic powers such as the mystic fire (Agni) the mystical wind [Vayu]. The words such as 'sacred', 'cosmic powers etc.' will be clarified in the next chapter. 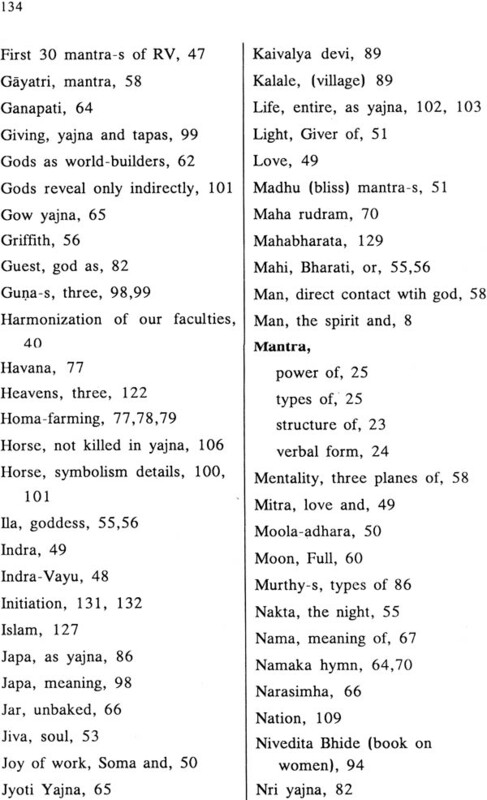 It is appropriate to note that in the four Veda books there is no mention of killing animals as a part of yajna. Of course in much later times, when the tantric beliefs were strong, animals were killed as a part of offering. 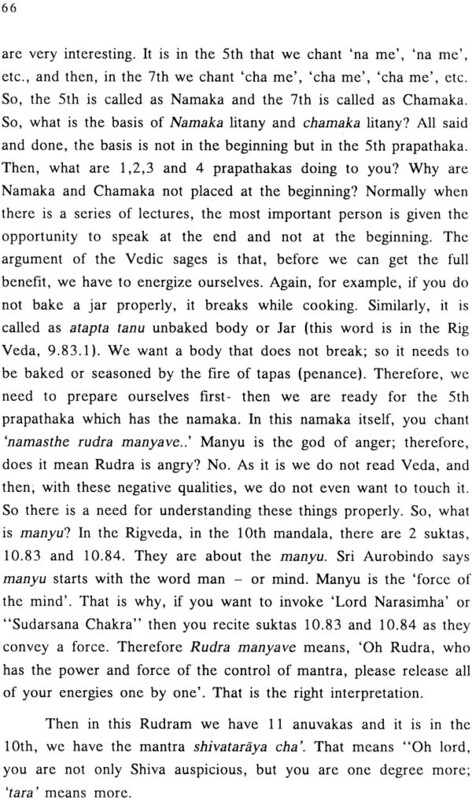 But the great commentators like Sayana who lived in the sixteenth century CE were aware of yajna-s with animal killing and thus imposed this idea of animal offerings on the mantra-so The mantra-s of the four Veda-s do not give any indication of any animal killing in the yajna-s mentioned in vedic times. 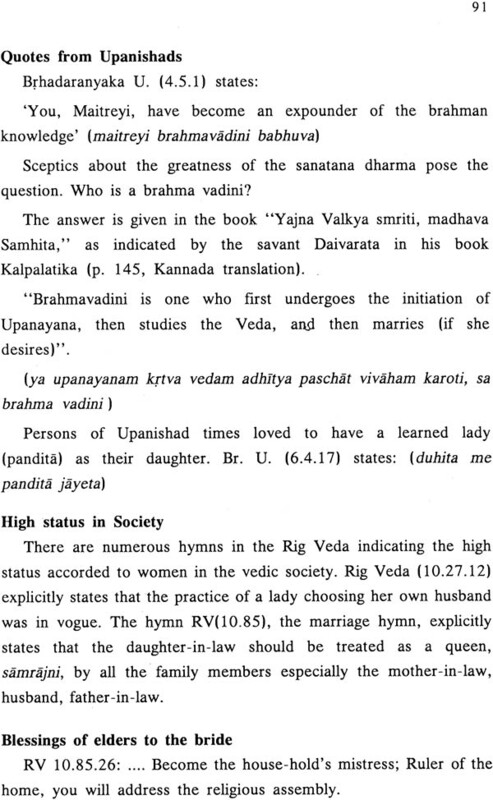 Note that Veda-s do not offer specifically any details about the outer yajna. It gives only broad outlines. What is the motivation for performing the yajna. It varies from person to person, time to time. 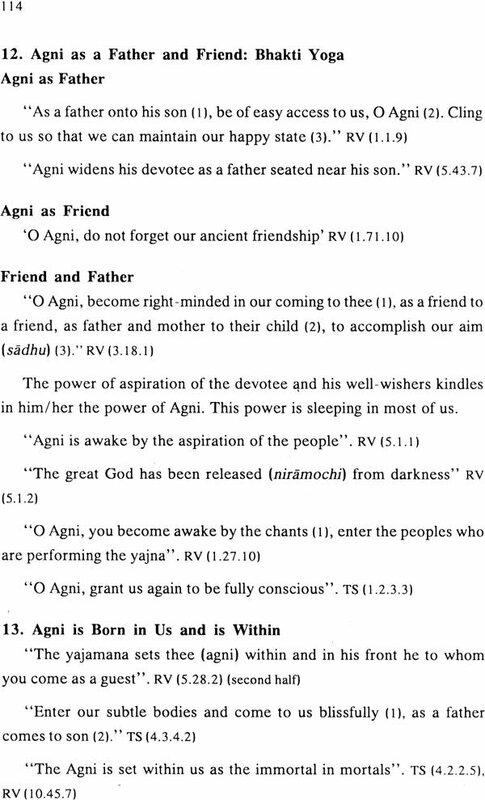 At the beginning of the yajna, the patron of the yajna and all the participants (including some spectators) make a list of the benefits expected for their families and relatives and pray that the cosmic powers may grant the benefits. No yajna is performed just to benefit a single person. Some pray for healthy longevity; some for physical riches, some for psychological riches like contentment, happiness, feeling happy at the success of others, becoming free of the proverbial six psychological enemies (anger, delusion about one's greatness, grabbing tendency and miserliness, envy harmful aggressiveness and illicit sexual desire). Some perform yajna for getting rain, and for warding of calamities. 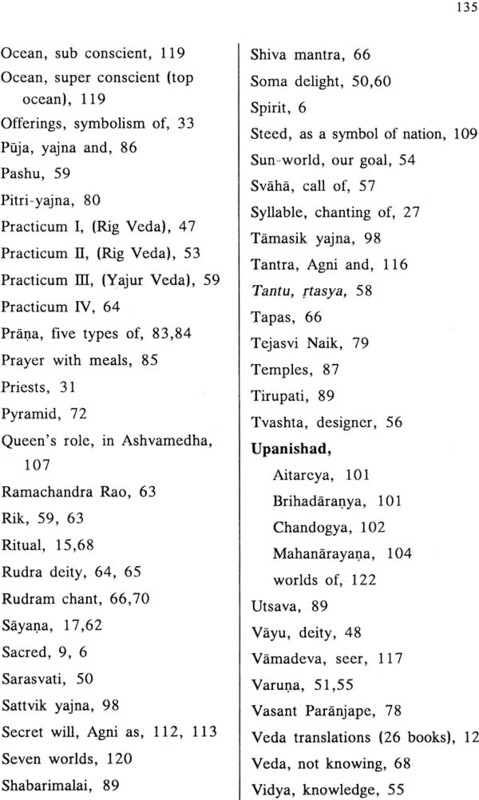 But a small number of vedic aspirants have a much higher goal; RV (1.170.4) calls it as the awakening of the consciousness to immortality (amrtasya chetanam). In some sense they aim at achieving the all-sided perfection, i.e., perfection as an artist, perfection as an organizer and administrator of organizations. Broadly this aim is called as the divinisation of life. Obviously even achieving perfection in one field in a life-time is difficult. 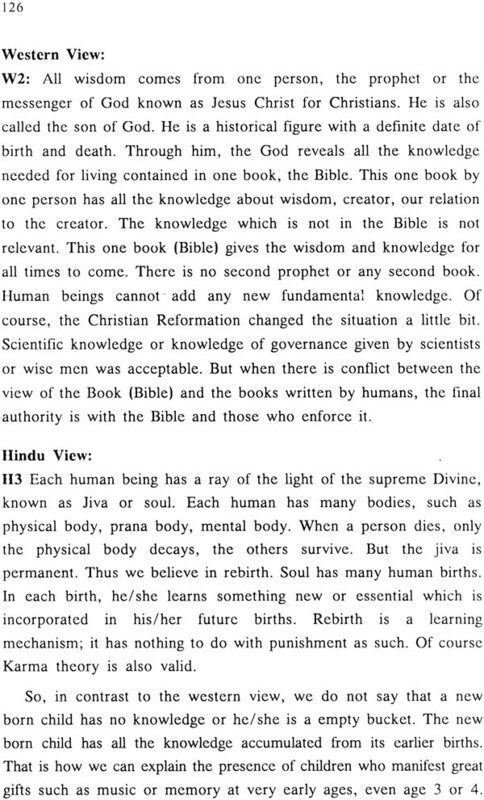 But veda stresses very much the fact of reincarnation or rebirth. Our life now is only one aspect. Each one of us will have hundreds of rebirths, in each birth we will achieve some degree of perfection which will be retained and remembered by our soul, even after our physical bodies are destroyed. This long journey culminates in divine perfection. More on the benefit of yajna in a later chapter. 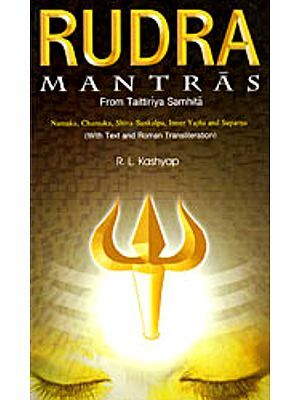 However RV (10.82.7) states that even among singers of mantra-s 'there are some who indulge in useless talk (jalpya), reciting mantra-s to satisfy their desires and enjoy life'. Clearly the high ideals were not practiced by some who were proficient in chanting mantra-s.